My husband got this wall clock from Guam. He was stationed there for years. He was still on active duty when I met him and Guam was his current post. Guam was also my port of entry in coming here in the States. My husband waited for me there and then we flew together in coming here. 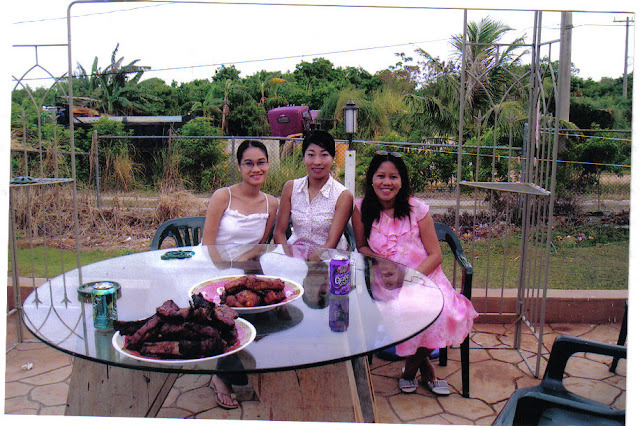 Below are some of the Asian ladies I've met in Guam. I was 7 months pregnant then, look how plump I was lol. Here is some facts about Guam from Wikipedia. "Guam (i/ˈɡwɑːm/; Chamorro: Guåhån) is an organized, unincorporated territory of the United States located in the western Pacific Ocean. It is one of five U.S. territories with an established civilian government. Guam is listed as one of sixteen Non-Self-Governing Territories by the Special Committee on Decolonization of the United Nations. The island's capital is Hagåtña (formerly Agaña). Guam is the largest and southernmost of the Mariana Islands. The Chamorros, Guam's indigenous people, first populated the island approximately 4,000 years ago. The island has a long history of European colonialism. Discovered by Ferdinand Magellan during a Spanish expedition on March 6, 1521, the first colony was established in 1668 by Spain with the arrival of settlers including Padre San Vitores, a Catholic missionary. For more than two centuries Guam was an important stopover for the Spanish Manila Galleons that crossed the Pacific annually. The island was controlled by Spain until 1898, when it was surrendered to the United States during the Spanish-American War and later formally ceded as part of the Treaty of Paris. I love an entry full of history. Thank you so much for the education. But also so important, is the warmth of friendship. The 3 of you look so lovely and I would not have noticed the pregnancy had you not mentioned it. So, was it a boy or a girl? That's about as far as I can go and still be in the US govt control! You look really cute and the ribs on the table look pretty good too! Very neat looking placque and great history info.